Enjoy superior sedan-like ride comfort with new Goodyear EfficientGrip SUV. Road noise and vibrations are minimised with QuietTred Technology, a combination of a computer-optimised tread pattern and a cushioning layer. 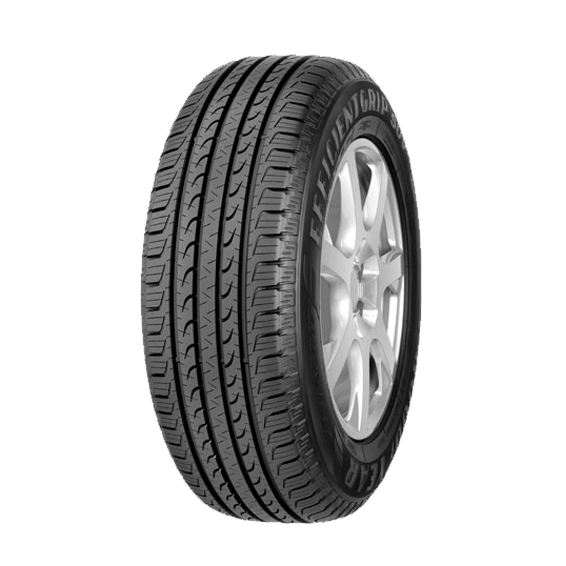 Plus, with enhanced road traction that increases tyre-to-tread contact when braking, Goodyear EfficientGrip SUV offers outstanding grip in wet conditions. Driving just become more luxurious and confident with Goodyear’s quietest SUV Tyre ever. Advance tread and carcass design provides improved noise performances as the tyre wears for a quieter, more comfortable ride. High number of biting edges offers greater blade density for superior braking and better control in wet driving conditions. Responsive structure that reacts to driver steering for crisp handling behaviour. High loaded silica blend compound reduces intra-molecular friction to provide a measurable reduction in fuel consumption. This program protects your Goodyear EfficientGrip SUV tires against road hazard damages. Tire replacement entitlement is applicable within 6 months from the date of purchase and remaining tread depth must be more than 6.0mm. For more information on the Worry Free Assurance program, please visit: Goodyear Worry Free Assurance.